The Batman Who Laughs: a lunatic driven mad by his world's Joker. The Red Death: a thief who stole his reality's Speed Force power. The Drowned: a female, amphibious Batman. The Dawnbreaker: a twisted Green Lantern. The Murder Machine: a deranged, deadly cyborg. The Merciless: a warrior who wears the helmet of Ares. The Devastator: a part-human, part-Doomsday monster. The evil Batmen - twisted mirror images of the Dark Knight - have been unleashed upon Earth and the Justice League with only one thing on their minds: total devastation. How can the World's Greatest Heroes stop a horde of deadly beings who appear to be powerful nightmare versions of familiar figures? 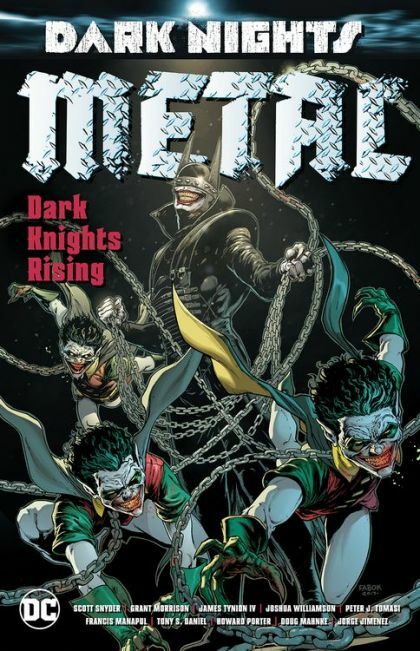 Featuring stories from Scott Snyder, James Tynion IV, Peter J. Tomasi, Grant Morrison, Joshua Williamson, Ethan Van Sciver, Philip Tan, Tyler Kirkham, Francis Manapul, Riley Rossmo, Tony S. Daniel, Howard Porter, Doug Mahnke and many more! Collects BATMAN: THE RED DEATH #1, BATMAN: THE DEVASTATOR #1, BATMAN: THE MERCILESS #1, BATMAN: THE MURDER MACHINE #1, BATMAN: THE DROWNED #1, BATMAN: THE DAWNBREAKER #1, THE BATMAN WHO LAUGHS #1 and DARK KNIGHTS RISING: THE WILD HUNT #1.